Last night I hosted hotpot night at my house and had tons of left over noodles and bok choy. 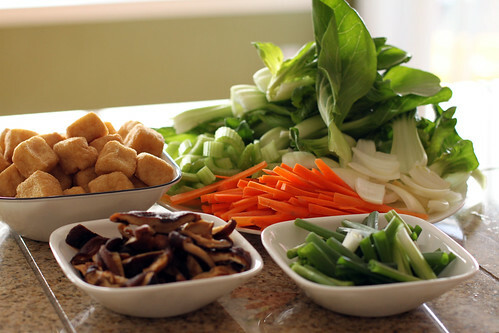 Since the noodles were ready to cook, I went to the grocery store and picked up some tofu, Shitake mushrooms, and vegetables to make a quick Vegetarian Chow Mein. I was excited about using dried Shitake mushrooms in this recipe because I never cooked with it before and couldn’t wait to try it. The mushrooms turned out pretty tasty, but I would only use it if fresh Shitake mushrooms were not available. In my opinion, fresh is always better. 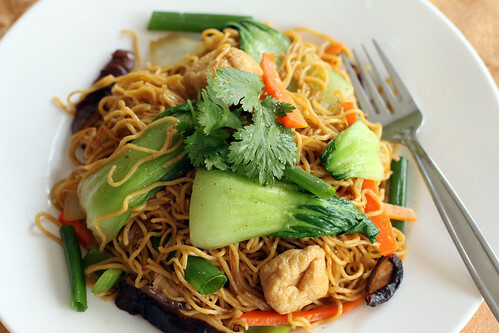 This love chow mein recipes because they are super easy to make and you can put anything you want in it. I strongly encourage you to use any meat and vegetable combination you like or have available in this recipe. It doesn’t have to be vegetarian. Put 5-6 pieces of dried Shitake mushrooms in a bowl, fill the bowl with warm water and soak and allow mushrooms to rehydrate for at least half an hour. After rehydrated, squeeze water from the mushrooms and slice. Clean and cut vegetables and set aside. In a bowl, combine vegetarian oyster sauce, soy sauce, sesame oil, minced garlic, and minced ginger, salt and pepper (to taste). 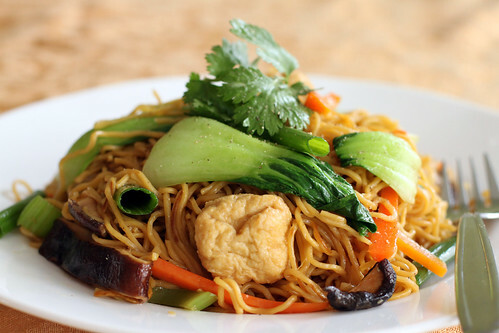 Bring water in a stock pot to a boil and cook chow mein noodles according to the package directions and set aside. 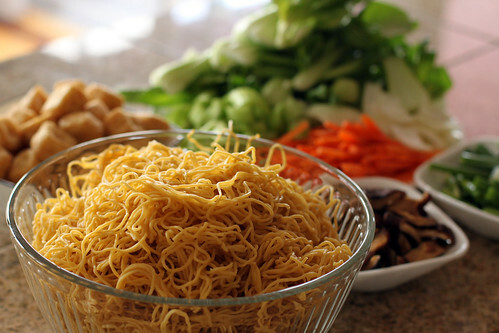 Tip: Make sure to loosen up noodles before putting in boiling water to prevent noodles from sticking together. 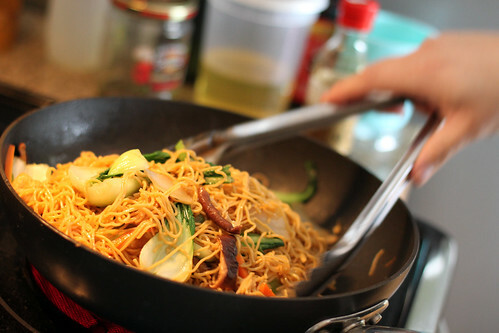 Heat wok to Medium-High and add 1 tablespoon of vegetable oil to the wok. Quickly stir fry carrots, celery, onions, bok choy, tofu in 1-2 tablespoon of prepared sauce for about 3 minutes and put in a bowl. 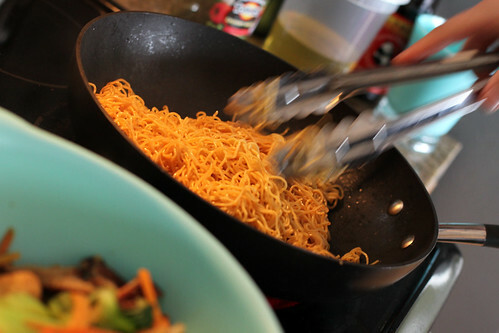 Add 2 tablespoons of oil to wok and add noodles. 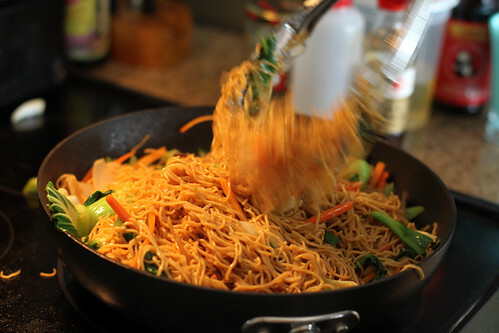 Add 2-3 more tablespoon of prepared sauce and stir fry noodles until the noodles are evenly coated. 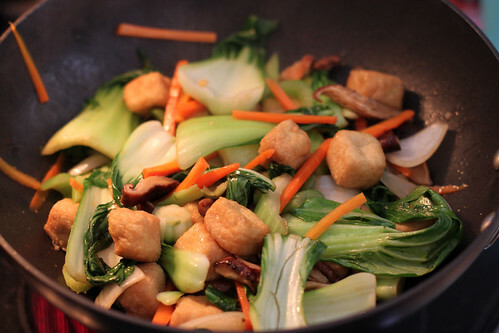 Add tofu and vegetables back into the wok, add green onions and mix in with the noodles.